This rare mandrake plant was photographed by someone who reads my blog. 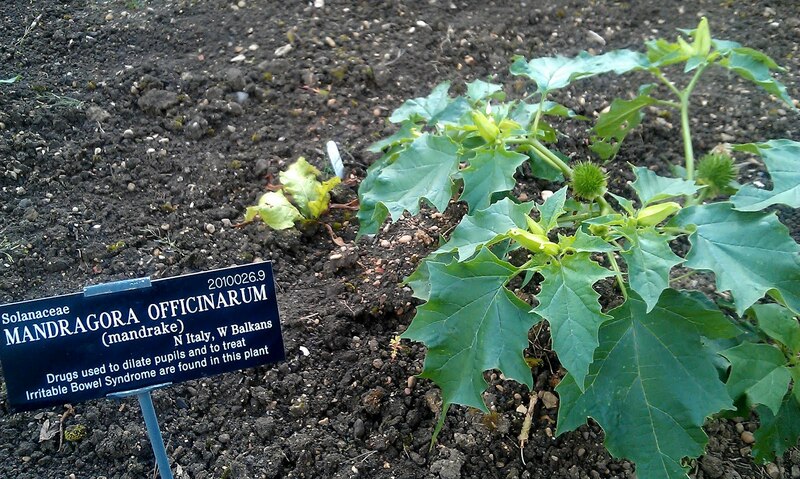 They kindly sent me the picture they had taken and said: "I was pottering around in the Oxford Botanical Gardens yesterday and took this photo of a mandrake plant, which was in the 'medicinal' area, because the witchy associations made me smile - and then I thought of you!" The watchful photographer said they didn't want to be named, which is fine, but thanks very much indeed for letting me publish it! Mandrake is, indeed, a very magical plant. It is the common name for members of the plant family Mandragora and is related to nightshades. Mandrake contains hallucinogenic alkaloids including atropine, scopolamine, apoatropine, hyoscyamine and is very poisonous. Although you obviously shouldn't eat it, it has been used by witches as a spell ingredient for countless centuries. The main part of the plant used for magic is the root, because it resembles a human figure. According to Cunningham's Encyclopaedia of Magical Herbs the plant has powers of protection, fertility, money, love and health. A whole mandrake root can be put on the mantelpiece or other central place in a house to protect the building and those within it. Money placed next to it is said to increase. According to folk tales, the root screams if it is dug up, a sound that kills all who hear it. The traditional way around this is to half dig it up, then tie one end of a string to the plant and another to a dog. The dog's owner then runs away fast - presumably with his fingers in his ears - and the dog uproots the plant when trying to follow him. Frankly, this seems horribly cruel to dogs and, in any case, if it was true that digging up mandrake roots is lethal then I guess there'd be a lot of dead gardeners at the Oxford Botanical Gardens. Apart from protection, the main use of a mandrake root in witchcraft is as a poppet - which is a humanoid form used for sympathetic magic. The idea is that the root can be dressed up as the person it is to represent, then spells cast on the root work instead on the person it symbolises. Wiccans and other nice witches would use this for healing purposes, although legends abound in which pins are stuck in the poppet in order to cause a person excruciating pain. Not very pleasant. Mandrake roots are also frequently associated with love magic. In the Bible, in the chapter of Genesis, Leah gives Rachel mandrakes in exchange for a night of sleeping with her husband. In 1518 Machiavelli wrote a play called Mandragola (The Mandrake) with a plot that involves the use of a mandrake potion as a ploy to bed a woman. In modern fantasy fiction, the mandrake root is cultivated by Professor Sprout in J. K. Rowling's Harry Potter and the Chamber of Secrets. It is used to cure the petrification of several characters who had looked into the eyes of the basilisk. In that book the characters use earmuffs to avoid hearing the scream of the root when it is unearthed - much easier than dodgy schemes involving dogs I would have thought. The photographer who sent me the photo of the mandrake also sent me a photo of a lovely Dahlia called "Moonfire" and the Botanic Garden's fishpond, which looked very picturesque. I'll be posting them up on my blog later! The photo on this page is copyright the photographer. Do not copy or download it without permission. This is not Mandrake. This is Datura. Check better. F - The photo was taken of a plant in the Oxford Botanical Gardens and that was the label the botanists there had given it, as my post said. If you are sure it is wrongly labelled, then you should email or phone the Oxford Botanical Gardens to tell them they have made a mistake in their labelling. I am sure they would be happy to discuss it with you. Please let me know what reply you get when you contact them, as I will would be delighted to mention this on my blog. Thanks for starting an interesting discussion. 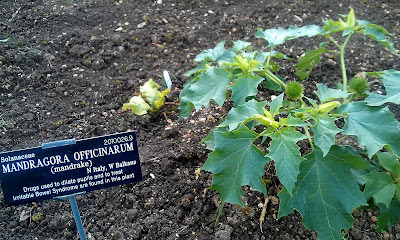 While the commenter above is correct that the large plant on the right is in fact Datura. He/she failed to see that there is a smaller plant to the left/middle that is very sickly looking, and is in fact Mandrake. Annwyn Avalon - thanks so much for your comment. I'm really pleased that the puzzle has been solved - and I've learnt something too!